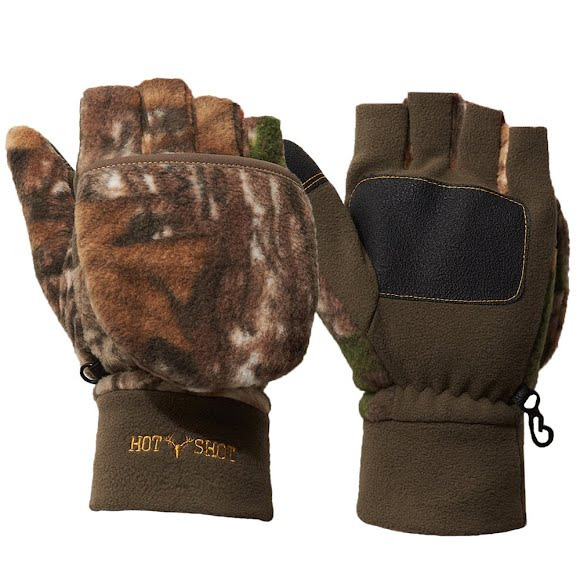 The Hot Shot Bullseye Fleece Glomitt has a pop top mitten with 40g of Thinsulate to keep your digits warm and comfortable so that when it comes time to pop the mitten for shot your fingers will be fully functional. RealTree camo won't give your position away and a sure grip palm patch helps you keep a firm grip on your equipment and weapon of choice. The Hot Shot Bullseye Fleece Glomitt has a pop top mitten with 40g of Thinsulate to keep your digits warm and comfortable so that when it comes time to pop the mitten for shot your fingers will be fully functional. RealTree camo won&apos;t give your position away and a sure grip palm patch helps you keep a firm grip on your equipment and weapon of choice. Making a great pattern better is no easy task, but RealTree has done it. New RealTree Hardwoods HD has been updated using a proprietary printing process. It is so realistic, it makes you feel like the outdoors when you wear it. You look at it and have a desire to get out your limb trimmers. It&apos;s that lifelike! It&apos;s a great pattern nationwide. In most instances, it&apos;s most effective from mid to late winter, then again in early spring. But in many areas the pattern can be used no matter the season. Closely consider the surroundings and situation where you&apos;ll be hunting and you, better than anyone, can make the right camo choice. RealTree AP (AP = All Purpose) is neutral, open, contrasty and realistic: all the things necessary to make a camo pattern versatile and effective. Perhaps more important are the improvements made to the already advanced printing process. RealTree has considered the effects of Mother Nature and washing machines and printed the pattern to hold its contrast through real-life conditions. Heat Factor X1 products are designed to offer warmth in cold weather conditions. HF X1 products contain up to but no more than 40 grams of branded insulation.